Temperature Rating -4°F to 140°F (-20°C to 60°C). Compatible with DYMO Organizer Xpress (3/8") Office Mate II (3/8"). Note: A minimum quantity of 360 must be ordered, and in units of 10 thereafter. 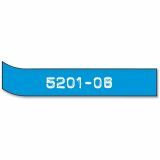 DYMO Self-Adhesive Glossy Labeling Tape for Embossers, 3/8" x 12 ft. Roll, Blue - Whether you use them indoors or outdoors, you can count on these plastic embossing labels to last. They stick to any smooth, clean surface and come in a vivid color for added visual impact and easy communication. Embossing labels feature raised lettering for an attractive three-dimensional effect. They do not fade over time, leave a sticky residue or break upon removal. They are great for files, binders and home organization. 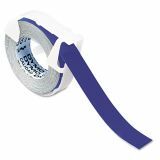 Self-adhesive label tape in a cassette is designed for use in Dymo embossers.